I’m a voice search evangelist – odd for someone who would literally rather die than speak to my phone in public. Yet, I am, I see the future of search as one completely integrated with our lives in the way I first saw in the early 90’s on Star Trek – which reveals two more things about me than I would like. The reason I believe this is that I see it borne out every day – in the generational shift to acceptance of voice search. While many Gen-X and up may still feel ‘like geeks’, 60% of all searches are now from mobile devices, and 20% of those are now spoken (12% of all searches, therefore, are both mobile and spoken) and it is rising all the time. The improving ability and accuracy of voice recognition software has doubtless played a part in this upward trend, but doubtless too is the influence of normalisation. The most important part of the shift to voice for the search industry, however, comes from the behaviour of Google. The recent release by Ahrefs of a Rank Tracker tool happened to happily coincide with an invitation to submit to State of Digital and this, in turn, prompted me to expand my constant ranting about voice search beyond the walls of Click Consult (where I write articles and tinker with the technical SEO and strategy and literally wrote the book [a book] on SEO). It is my belief (and doubtless that of numerous others), that the push to provide quick answers in SERPs is part and parcel of Google’s preparation for a future in which voice search is as integral to our lives as search is now. It is for this reason – my hypothesis runs – the position zero ‘quick answer’ does not always come from the top position in SERPs. While other SEO factors undoubtedly play a part (the quick answer almost always comes from one of the top five results, so mastery of other techniques is required to even qualify for the race), there is a definite correlation between voice search and position zero. In an effort to prove this, and to take a first look at the new Ahrefs tool, I decided to run an experiment. I chose 10 of the industry specific long tail keywords for which Click Consult competes (which had a rich snippet quick answer box) and began running some voice searches. Of the 10 results, only one search resulted in my being directed to read the SERP, only two quick answers were taken from the top result (none from below position three), four came from Wikipedia and eight were paragraphs, with the other two featuring lists. Review of key aspects of pages featuring in the answer box. While the sample size of my research here is small (by necessity rather than desire, there’s only so much time I can devote to flights of fancy), there were a number of surprising results of even such a small data set. If there are two things you can be certain about in search marketing, they are that the industry terms will be highly competitive and that the companies competing will know exactly how to compete. So why, then, were only 60% of quick answers owned by companies working in the industry? In my opinion this has a lot to do with Google’s desire to make these quick answers voice search friendly. Take the result for ‘display advertising’ for example, the first position (at the time of writing) was held by a page with great DA (86), featured a comprehensive near 1200 word article which was well linked to and from, while the quick answer came from Marketing Land, which ranked in third position with a category page listing news features about ‘display advertising’. While I’m sure a searcher could learn all they needed to know from the host of display advertising articles on offer there, it was instead the quick, punchy intro that was chosen to feature in position zero. This, really, is the trend throughout the list of quick answers I looked at. The answer is prominent on the landing page, is short, keyword rich and informative (in all but one case, which I’ll return to). The definition from the first placed site for this keyword was no lesser an explanation, but it did feature as the third and fourth paragraph, was almost twice as long, less keyword rich, beneath an h3 rather than h1 tag and refers to a specific ‘display ad’ rather than ‘display advertising’ as a practice. This is obviously something which should raise alarm bells for SEOs and content writers throughout the industry – especially those writing in industries which feature quick answer boxes at present (though they’re only going to become more prevalent). The continuing roll out of position zero across numerous services means that SEOs are going to need to reconsider the way they present their content as Google pushes ever onward to a Mobile First rather than Mobile Friendly strategy – and, as a result, toward a search experience that caters to the ever increasing use of voice. 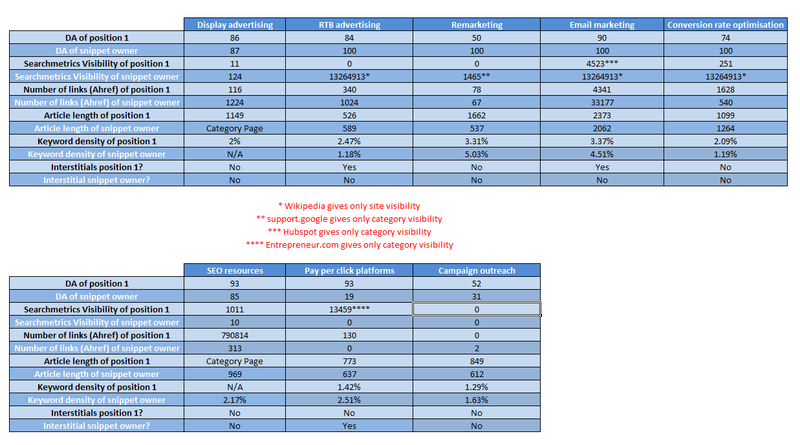 Important ranking factors measured for position one pages versus rich answer pages. Position zero will, in many sectors (particularly B2B) simply replace position one as the ultimate aim of the SEO campaign, which means that there will need to be a number of items added to the list of what makes good content for SEO (this in no way underplays the fact that content should always be written with the consumer at the forefront of the mind, but as an industry it would be dishonest to say that SEO value is not of great importance in content production). This is why, as things stand, Wikipedia occupies so many of answer boxes – the short, descriptive answer is exactly what they do (with thousands of volunteer editors refining and updating answers all the time). While search marketers and SEOs have developed techniques which blend great content with great SEO, Wikipedia has been unknowingly preparing for the answer box since its inception. This answer (trimmed though it is) is the featured snippet for the keyword ‘email marketing’. That’s not to say the system is perfect as things stand – and it reinforces the focus of voice search for these quick answers – the one result which was not spoken when searched for was that of ‘pay-per-click keyword strategy’. One of the two answers that came from position one in the SERP, the answer for this search as spoken by the Google Assistant was simply ‘Here’s what I found for pay-per-click keyword strategy’ – the fact that (despite the answer coming from one of the kings of PPC) it did not really address the search must surely have played a part in the Google Assistant’s decision not to provide the answer directly. Pay-per-click keyword strategy answer box. While it is impossible to say for certain that the answer box is driven by voice search, four of Google’s big announcements at I/O 2017 involved Home and the Google Assistant – predominately voice activated technology – showing a clear commitment to the development of voice interaction, as does their recently announced partnership with Walmart on voice-based search. Clarity – should be easily understood by the searcher. Brevity – should provide a quick overview even if as part of a longer explanation. Relevance – should directly relate to the search term. All of which are key components of the quick answer. However, one aspect of my pet theory is: you don’t need to believe in the driving force behind the proliferation of quick answers. There are numerous varieties of quick answer, whether it’s lists, recipes descriptions, or answers to specific questions. You’ll know which variety applies to your brand, so look at industry terms, see what is presently occupying those position 0s and look to incorporate the practices when you produce your content. This includes things such as the position of key elements on the page, their length, whether they feature a title and which header tag they should fall between. 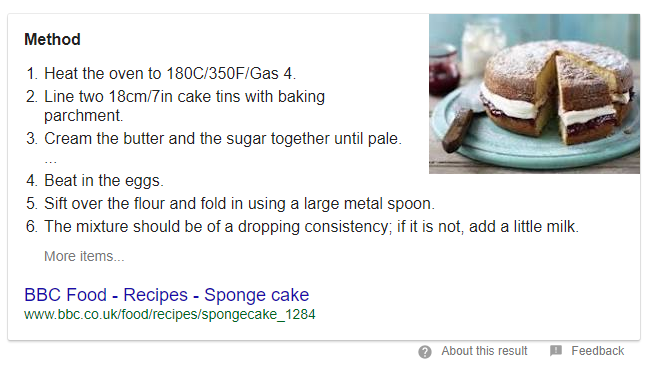 Recipe for sponge cake as a quick answer. While the consumer is the audience, it has to be acknowledged that the audience is reached via a number of algorithms and through technology. It would make no more sense for the BBC to ignore the mark-up when writing its recipes than it would for a guitarist to ignore their guitar. In this metaphor, the guitarless guitarist would still have an audience, would still have the necessary expertise, but would lack the means to reach one with the other, no matter how wonderfully personalised and thought provoking, emotional or shareable their riffs may be. Producing great content for consumers should still be the primary concern, but with studies showing that 42% of professionally marketed blog posts receive fewer than ten interactions, better visibility for your great content must be a driving force behind your efforts. 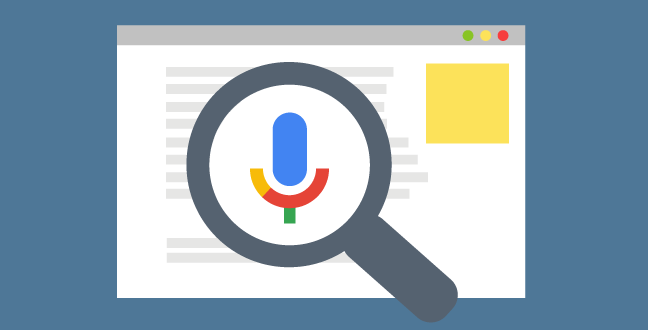 Whether it’s due to voice search or not, let your content speak for itself by ensuring you give it the best chance with your mark-up and by being ‘clear, brief, and relevant’ with sections of your content you want to feature in SERPs.